The 21st Annual Screen Actor Guild Awards took place yesterday night, bringing such big names together as Julia Roberts, Julianne Moore, Lupita Nyong’o, Reese Witherspoon, Keira Knightley and others, who shone bright on the red carpet donning the most imaginative, breathtaking and out-of-this-world designer gowns, complemented with the most luxurious jewelry designs, accessories and their beautiful smiles. Taking place in between the famous Golden Globes and Oscars, SAG Awards might not receive much attention, however, it’s really hard not to talk about the flabbergasting SAG Awards 2015 red carpet fashion, pointing out the most gorgeously dressed celebrities, who might inspire you to look your best at various important events to come. 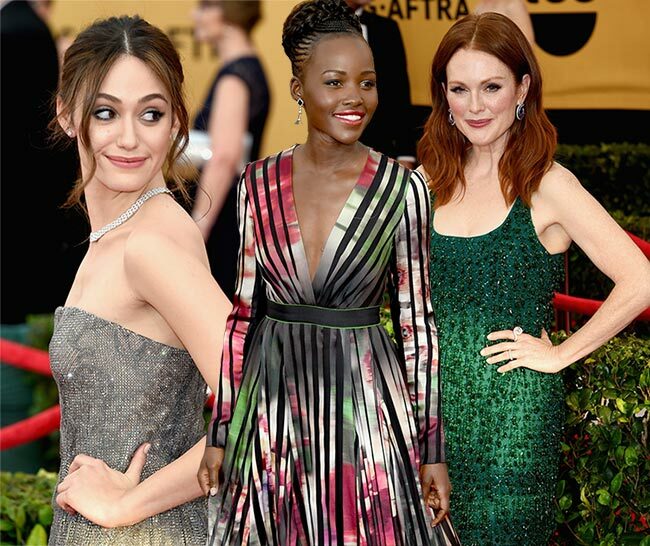 Below, browse through our list of the 10 best red carpet dresses spotted at the SAG Awards 2015 that you are sure to fall in love with instantly! She definitely knows how to break the stereotypes and bring innovation to the red carpet, every time picking the coolest and most exquisite outfit that keeps the media buzzing for weeks and that inspires sassy fashionisers from around the world for an entire year or longer. Emma Stone looked equally bedazzling yesterday night, donning a Christian Dior Couture gown in black featuring a modest tuxedo mini dress and a sophisticated sheer chiffon fabric coming from underneath of the tuxedo jacket and reaching the floor. It’s a modern and elegant look, which is 100% unique and spectacular, especially when finished off with black Christian Louboutin heeled sandals and Repossi jewelry. We adore Lupita Nyongo’s bright style and her skills to play with the most dangerous colors, looking so chic every time. 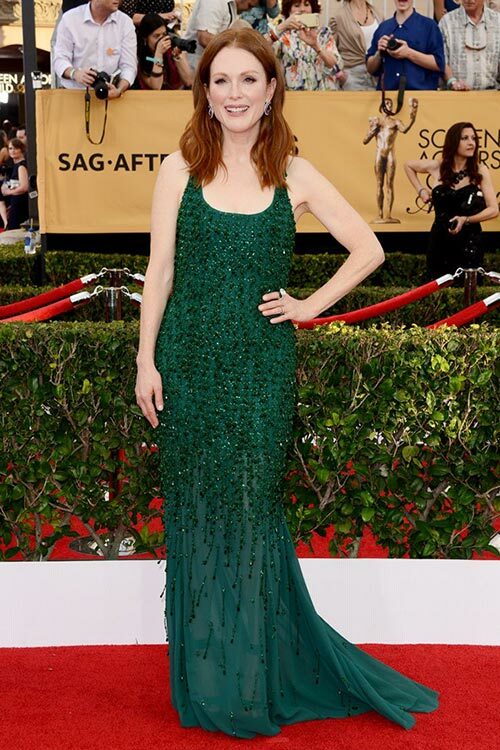 She is definitely among the best-dressed celebrities at the SAG Awards 2015 ceremony, wearing a chic gown from the Elie Saab pre-fall 2015 collection. It’s a floor-length deep V-neck dress with long sleeves patterned with beautiful vertical stripes that beautifully blend with watercolor patterns inspired from the nature. She used Fred Leighton jewelry to complete her outfit, as well as an intricately braided hairstyle and a bright lipstick. Timeless black was the choice of Rosamund Pike, who decided to make a big sartorial statement playing with textures and innovative shapes. Her Christian Dior Couture dress from the fashion house’s SS 2014 collection features an asymmetric hemline and 3D fur applications that give lots of texture to it. Classic black pumps and Fred Leighton jewels ideally finished off her outfit, while the bright orange lipstick was used to add a touch of color to her monochrome look. Emmy Rossum was the princess of the night, hitting the red carpet in a fabulous Armani Privé gown from the brand’s SS 2015 collection. It’s a gentle strapless design in fine lace complemented with glittery particles for the real princess-y feel. She put the entire focus on her breathtaking dress, keeping the accessories to minimum and using just a luxury diamond necklace to complete her look. Gathering her hair high in a romantic updo, she put all the emphasis on her beautiful skin and lean body. This is one of the most effortlessly chic looks we spotted yesterday night. Pregnant beauty Keira Knightly looked so bohemian and chic at the SAG Awards 2015 wearing a beautiful Erdem gown in a rich purple color. Luxurious Repossi jewels completed her outfit along with the half-up half-down natural waves that boosted the bohemian feel of her overall look. Her lovely baby bump looked so flattering under the little peplum details the dress featured, while her soft makeup with smokey eyes only enhanced her radiant appearance. Appearing in a custom made Vera Wang gown with a deep V-neck, a bejeweled bodice and a flowing skirt featuring delicate organza, Sarah Hyland was the modern and sassy doll on the red carpet, looking so elegant and feminine. Lorraine Schwartz jewels and a deep side-parted sleek updo completed this ethereal look of hers, turning her into one of the best-dressed at the party. We love the timeless fresh feel created with the help of the emerald green color, which always looks so opulent, festive and glamorous. The color flatters Julianne Moore so much, being perfectly contrasted with her auburn hair color and looking way too dazzling to be ignored. She hit the red carpet wearing a Givenchy Haute Couture by Riccardo Tisco dress adorned with beads used for a more glamorous feel. Chopard jewels and center-part natural wavy hair added to the perfection of her overall appearance. Julia Roberts did manage to stand out in the crowd despite the fact that her outfit was in the classic black color, which may seem a bit monotonous and boring to some. Instead of the princess gowns and floor-length dresses, she gave preference to a classy jumpsuit from Givenchy by Riccardo Tisci, which was harmoniously paired with black heeled sandals, a little black clutch and Tiffany & Co. jewels. Her world-famous smile was definitely the best accessory of her shining look. A modest and elegant Balenciaga gown was the pick of Naomi Watts, who completed her outfit with luxurious Bulgari jewelry and soft side-parted wavy hair. The off-the-shoulder design of her dress gave a high dose of sophistication to her overall minimalistic red carpet look and it’s here that we need to mention that a good style is all about small details. You can look pretty glamorous wearing a little black dress or a simple long gown in a dark navy blue tone, if the dress has the small details to catch the eye and is accessorized with the right jewelry pieces. Equally modest, simplistic and elegant was Felicity Jones, who looked so fragile and lovely in a pastel-toned Balenciaga gown accessorized with Van Cleef & Arpels jewels. It was the criss-cross detailing used on the top part of the dress that injected interest to this rather minimalistic design. Felicity’s classic updo and minimal makeup were the perfect fit for her timelessly classic and feminine outfit.